five + seven = Required Please enter the correct value. Gold prices today (Wednesday) were up a whopping $18.70 an ounce (up 1.43%) as of 12:30 p.m. EDT. Spot gold traded at $1,307.30 an ounce after closing at $1,288.60 an ounce in the previous session. Why gold is up today: Gold prices on Tuesday morning staged the biggest advance since mid-October. 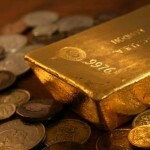 Gold prices ended Tuesday's session sharply higher, hitting a three-week high. February gold gained $28, or 1.5%, at $1,262.20 an ounce. Spot gold added $22.70 to reach $1,263.50 an ounce.